Each Colgate former employee has developed a strong professional and personal network. These colleague share common values: friendliness, solidarity and comradeship. Colgate Alumni platform developed by AlumnForce was designed in order the help Colgate former employees keep on sharing these values in a warm environment. A new dynamic board is committed to revitalize the network with cutting edge online tools. 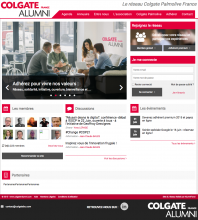 AlumnForce solution enables Colgate former employees to access the online directory in a few clicks to get in touch and discuss with former colleagues or to make the most of their professional network and make business. A private online forum gives the opportunity to all Colgate former employees to ask questions, share experience and know-how or to exchange on any kind of topics. Via the online agenda anyone in the network is aware of upcoming events organized by the network, can subscribe online and see in the attendees’ list who is also going to the event. Colgate AlumnForce solution is a powerful networking tool but also a tool to foster comradeship among Colgate former employees’ network.